MUM, I am trying to make sandwiches on Sunday that I can take to work for the whole week. Are you now, how’s that going then? Well not that well. Do you have any ideas? That’s how the breakfast sandwich started and this is how it has finished. There are a couple of steps but believe me a few steps on Sunday will save you on Monday, Tuesday, Wednesday………. I’ve used quite flat rolls in both wholewheat and white roll and I’ve also used soft style rolls. They need to be sturdy enough to withstand freezing and soft enough to be great reheated. i haven’t tried sourdough..yet, and can’t imagine how they might turn out but let me know if you do. 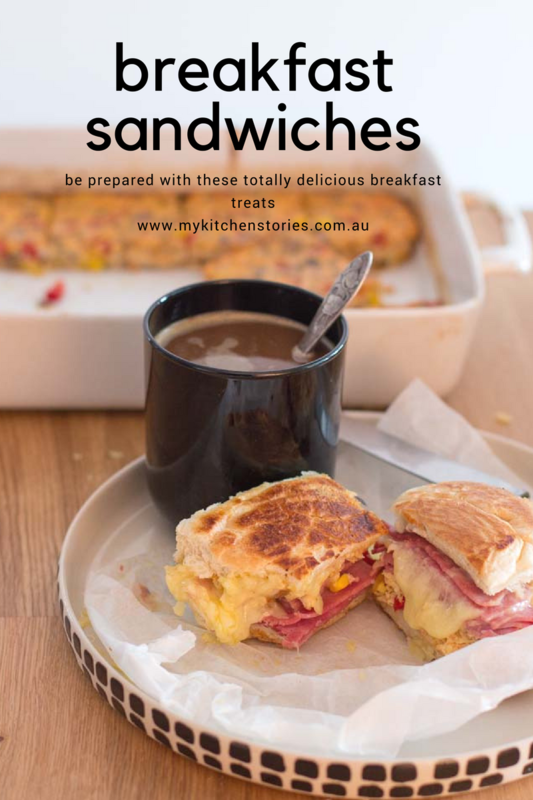 These breakfast sandwiches are really the best if you have access to a sandwich press, oven or even a microwave so the the cheese melts . You can see I have used grated sharp cheddar and that’s because I don’t like stringy tasteless Mozzarella cheese but hey, I am not going to judge if you do. You could also use sliced cheese if you prefer that but I am sticking to the classic cheddar for my melt and flavour but you could use Gruyere, Havarti or anything else you like. Get a production line going. I had dozens of these in the freezer. I also have lots of house guests and the stash I had was depleted in a very short time. Give them a try and let me know how you go. Set the oven to 190 C / 360 F.
Start by making the egg frittata mixture. Heat a fry pan on medium and add the olive oil then the onion and saute till softened. Add the oregano, add red pepper and corn and saute for a couple of minutes without colouring before adding the chickpeas. Stir well. Beat the eggs, milk, tomato sauce and salt and pepper together till well combined and pour over the vegetables spreading flat. Take the egg out and set aside to cool while you prepare the bread. Cut all the rolls down the middle and open them. 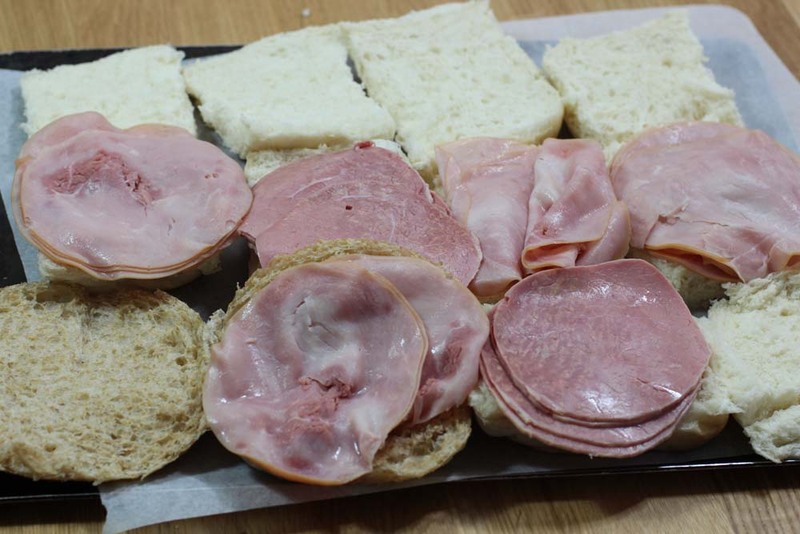 Pile the slices of ham onto each roll. 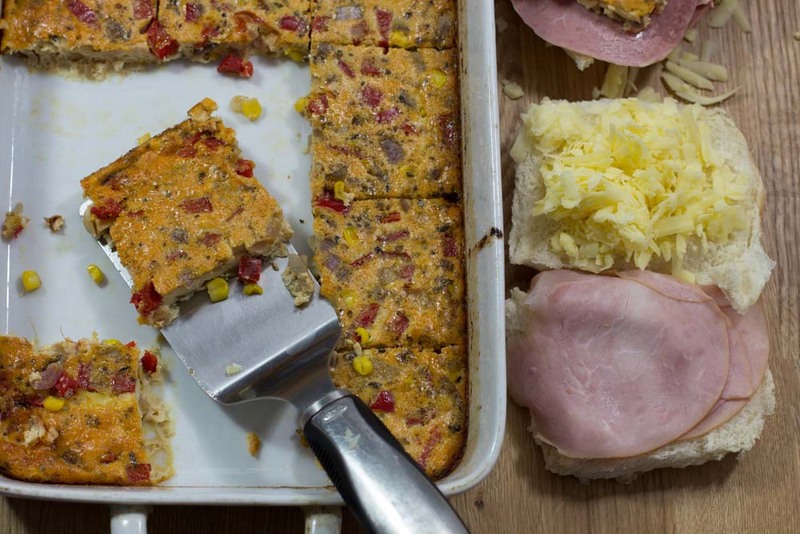 Top with grated cheese and then a slice of frittata. You should get at least 12 squares from your dish (23 x 30 cm). Measure them out evenly before slicing into squares. Once filled put the top on the sandwich and wrap in baking paper and then foil. You could add finely cut bacon to your eggs if you want to skip the ham. Just toss 2 finely chopped rashers in with the onions and saute. This will take a little longer as the bacon needs to be heated through well. Those look great Tania, a perfect way to start a busy day. It’s also great that you suggested several options to reheat and melt them, my favourite is the press. The variety of cheese suggestions are great too. Oh yes these really are a great one to have on hand. i like them in the press too. magnificent idea! 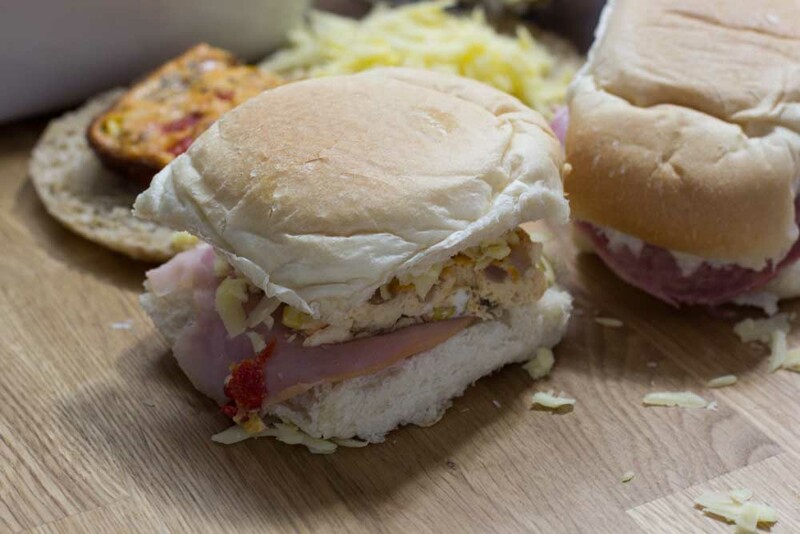 the final sandwiches look so tasty, and they couldn’t be more convenient! Hmm. 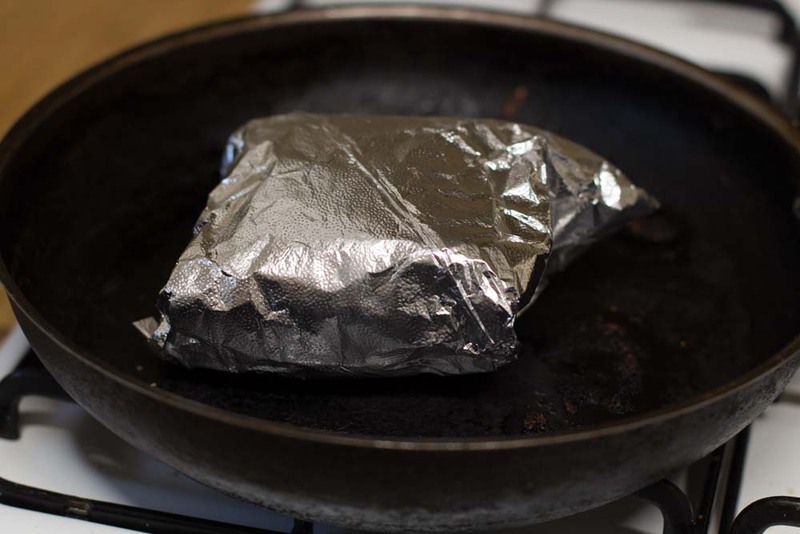 I have never tried to wrap the burger in the aluminum foil before and cooking on the frying pan. What a brilliant idea! I think I was living under a rock! So cool!!! 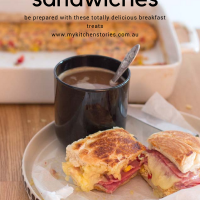 It looks great Tania, and also great recipe..